Orlov’s blast beat Hutchinson low stick-side, with Justin Williams also providing a screen at the top of the crease. Kuznetsov added a goal in the third — his eighth — for cushion, a nifty backhand on an assist by Marcus Johansson after the Swede created a turnover just outside the Winnipeg zone and fed the streaking Kuznetsov down the slot. Williams started the scoring just 1:12 into the game. The Caps (15-5-1) had good sustained pressure and John Carlson‘s shot went wide, but Williams was on the doorstep to corral the rebound and get it past the sprawled Hutchinson for his sixth of the season. Tyler Myers and Andrew Ladd gave Winnipeg a 2-1 lead toward the latter part of the first, but the Caps took advantage of a Dustin Byfuglien interference penalty and Alex Ovechkin notched his 11 of the season, from his customary spot in the left wing circle, with 1:14 left in the opening frame to forge a 2-all tie. Nick Backstrom gave the Caps a brief lead at 10:03 of the second with his eighth of the year, tipping in a Nate Schmidt cross-crease pass after Schmidt activated with the puck deep into Winnipeg’s zone. But Perreault tied it up with a snap shot while Jason Chimera sat for a tripping penalty. Coach Barry Trotz spoke about how the Caps are starting to gain momentum as the schedule proceeds toward the holidays. The way the team has played on this homestand is going to make believers out of a lot of people, not just folks on the payroll. 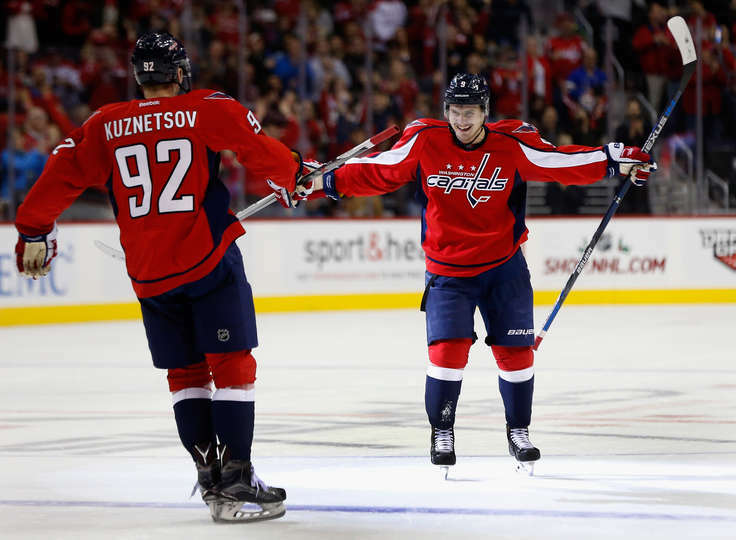 Evgeny Kuznetsov earned three points (1g, 2a), marking his fifth three-point game of the season and his second in the last three games (11/21 vs. COL: 1g, 2a). He has earned nine points in his last seven games (11/12-11/25: 3g, 6a). John Carlson earned two assists tonight, marking his third multi-assist game of the season and the 24th multi-assist game of his career. With his first assist in the first period, Carlson passed Rod Langway (202) for eighth place on the Capitals franchise points by a defenseman list. Braden Holtby stopped 23 shots to earn his 13th win of the season and win his fifth consecutive start (11/12-11/25). The Capitals improved to 15-5-1 (31 points) this season, marking the team’s second best start (in terms of points and wins) in franchise history. Washington posted a 16-5-0 record (32 points) through 21 games in 1991-92. The Capitals have won eight of their last nine games against the Jets (8-1-0) and have won four consecutive home games against Winnipeg. NEXT GAME: The Caps host Tampa Bay on Friday at 7 p.m. to conclude their season-long high five-game homestand.